[Editor’s note: The American Alpine Institute has teamed up with the American Climber Science Program to support a variety of important research projects in mountain environments. High mountain regions – especially those with glaciers – are a treasure trove of important data that can reveal a lot about the functioning and health of alpine ecosystems and their individual components as well as inform upon large-scale phenomena like climate change. Click on the link to read about the Institute’s commitment to alpine research and that research’s potential for helpful impact on social policy (e.g., land management) as well as more on the research to be done by the author. We just got back to Huaraz from our third and final area for sampling in the Cordillera Real, the Llanganuco Valley. This valley was by far the most populated by tourists of those that we have visited. 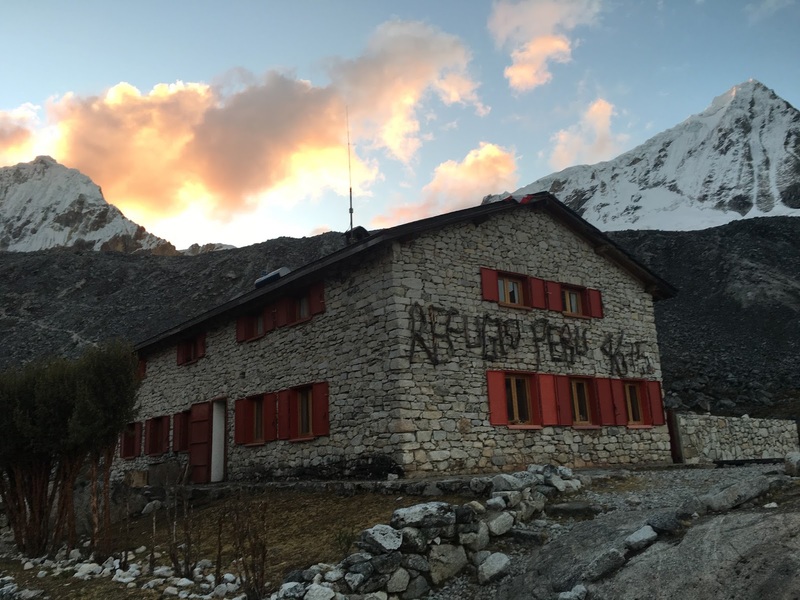 I was surprised to see that there is even a European-style refugio just a short walk from the Nevado Pisco basecamp. We spent three nights there, and it was a nice change of pace to grab a warm drink at the refugio after a long day of hiking. Just a short walk from basecamp, the refugio was a great place to relax with hot chocolate or a Pisco Sour. The abundance of tourists provided a contrast from the first two valleys that we visited and allowed us to get a closer look at human impacts on the Huascaran National Park. For one, there was a noticeable amount of garbage and human waste littering the otherwise pristine park. It quickly became clear that not everyone who visits the park is as well-versed in the Leave No Trace ethics and techniques as our group. The Llanganuco Valley was arguably the most beautiful that we have seen, scattered with bright blue alpine lakes and surrounded by views of Pisco, Huandoy massif, Chakraraju, and Nevado Hauscaran. However, it has paid a high price of increased human impact. lot of encouragement from him on our long hikes. The Llanganuco Valley was created by massive glacial movement. Many of our hikes involved major boulder-hopping, as large granite boulders had been transported and deposited throughout the valley by ancient glaciers. Through the ages, as the glaciers cut away at valley walls, landslides deposited large and small debris on their surfaces creating and after subsequent recession, revealing huge lateral and terminal moraines. Terminal moraines have worked as dams and created most of the lakes in the region. We took at lot of samples from a variety of lakes, and some of us also took a refreshing dip in the icy glacial water bodies. They certainly looked inviting, and they certainly were cold! We went for a paddle in the first lake that we visited. The American Climber Science Program climbers with our group summited Pisco this time to collect snow samples. The view from the summit was much more clear than that of Maparaju, and the climb was also less technical which made it much easier for new climbers. As we pack up our science gear and prepare to head home or to embark on personal travels, we have been thinking a lot about the implications of our research. Some of us, including myself, will continue to work with the samples we collected once we return to Western Washington University in Bellingham, Washington. Other students are graduating and therefore will not continue to follow up on their research from this trip. The extreme glacial recession that we have seen on this trip makes the samples that we gathered even more important, as there will be steadily less glacier mass left to sample from in coming years. The talks that we heard by researchers from around the world at the International Mountain Ecosystems Forum echoed that message. Glacial recession is happening at an unprecedented rate, and it is affecting hydrology, biodiversity, agriculture, and the people who live in the Cordillera Blanca. One goal of the International Mountain Ecosystems Forum is to bring climate change to the attention of the Peruvian government. It is abundantly clear to everyone who has done any amount of research on the subject that Peruvian glaciers are endangered and entire ecosystems are as well. However, there is much work to be done in making the rest of the world aware of these pressing issues and the impacts on "downstream" ecosystems that will ensue. Less water stored as snow and ice will mean steadily less water flowing out of the mountains. Some mountain valleys will become uninhabitable, and the desert plain that makes up the western portion of Peru will eventually run desperately short of water. A large part of Peru's population resides on the coastal plains, and those areas are totally dependent on water supply from the annual melting of snows in the mountains. Now that most all of the annual snows are melting each year and the melt is eating into what used to be thought of as permanent ice, the reservoir of this ice is being drawn down. As that reservoir runs drier, there is the potential for major population displacement. The implications of the changes we have been observing are huge, and governments such as those in Peru see the need to begin planning now for the major changes that are threats in the not too distant future. Our hope is that research and conferences such as the one we have participated in will help that planning develop at a rapid pace.